Other jewelers regularly tell prospective clients that lab-grown diamonds have zero resale value. This is false. Just as mined diamonds have some resale value, lab diamonds have a similar resale value as a portion of the original sale price. It is a common misconception that the price of growing diamonds will fall precipitously in the decades ahead. It is Ada Diamonds' position that the costs to grow each diamond in a laboratory will always be greater than the cost to dig diamonds out of the Earth. The misconception hinges on three incorrect assumptions: Diamonds are rare, there will be enough diamonds grown in labs around the world to reduce that rarity, and it is far cheaper to grow diamonds than it is to mine them. If it is more expensive to grow a diamond than to mine one, how is Ada able to offer lab diamonds at a discount to mined diamonds? Two main reasons: It's far more profitable to mine than grow diamonds and Ada runs an extremely efficient 21st Century supply chain. 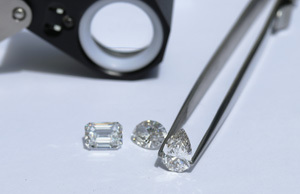 Just like a mined diamond, the price of a lab diamond varies greatly depending on the shape and quality of the diamond. A 1-carat diamond from Ada Diamonds can start at $3,200 and go up to $13,000 for a perfect, flawless diamond.